Tienes que tener buena relacion con la ciudad además de ser su vasallo. La manera "facil" es usar el menu de trucos para buscar lo que te guste y comprarlo. Como te quita el dinero igual, sería como "comprar a la carta". Yo lo he usado varias veces, pero "legalmente" como digo, sin subirme el dinero, solo comprando lo que puedo permitirme. Por cierto, el dia 8 de Junio sale la version 3.5 que ya he traducido. Así que tendréis de salida el mod traducido, espero que lo disfrutéis! Standardised text colours when recruiting npc's. Updated Spanish localisation for 3.0 translated by Boalmo & Kokemen. Base attribute needed for inventory management has been changed to strength instead of intelligence. Adjusted map icon textures. They now look a little more vibrant. Adjusted many map icon positions and centralised the flags. Adjusted parts of the campaign map. re-enabled find item cheat for testing purposes. (test build). Added healer to Ashefa Athaozar. Weeping Town is now correctly accessible from the sea. Adjusted map sea ai. This fixes issues where ships would get stuck around Sunspear when the player owned Ashefa Athaozar or other places lords would get stuck going back and forth between the same port. Adjusted Westerosi bandit party spawn points. Added several of the northern mountain clans. Added more wildling raiding parties north of the wall. Buffed giants, they should be able to take quite a few more arrows to the head. Storms End is now a Town. Pyke is now a castle. Added new troop tree for Qohor. Slightly modified various other troops trees in Essos. Added 6 new castles to Essos. Added 6 new villages to Essos. Removed being able to exit the citadel via the door which removes the re-spawn bug. Maesters now send ravens instead of tavern keepers. Consolidated Nights Watch and Free Folk patrol parties. This should make the quests related to these a bit more transparent. Joining the Nights Watch will join you as a soldier now instead of a vassal. Stream lined the mine menus and fixed being able to put lords here - this could end up causing clones. Added more text to show info about the religions in all locations. Varys should keep his attire when meeting behind the Great Sept.
Added an option to disable shot distance reports. Added separate options to change the damage dealt and received from all hero units (lords and companions) (patreon pledge feature request). The campaign type in the options menu should now display if you are playing static mode or not. Various changes to AI in battles. This should make battles a bit less static, especially when in freelancer. Balon Swann is now part of the Stormlands. Increased Stannis Baratheons starting renown. You should no longer get ambushed whilst entrenched. Added White Harbour Knights to Lord Wyman Manderlys party. Removed Dawn from Edric Dayne. Added 13 new noble clothes created by Kraggrim. Sand Warrior now has a spear instead of a lance. The lair weaponsmith can now refine weapons. Removed knight banners from merchants and added them to faction blacksmiths. Settlement whores now have hair. Added secret chest to Starfall. Added secret chest to King's Landing. Added Tyrell House Guards to Highgarden and Mace's parties. Whitewalker and Wight parties can no longer use the sea. Some bows are less shiny. Added a warning of the penalties when killing a lord. Added a new event and scenes for the Twins. Adjusted The Lands of Always Winter quest. Added Quest 'Mutiny at Craster's Keep'. 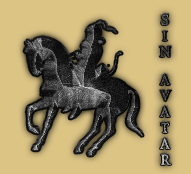 Added and adjusted horse archer code from 1257AD. Added updated Spanish translation from Kokemen. Moved archers in Riverrun siege scene that could not be reached. Plus fixed mesh issues. Adjusted/Added ai mesh and terrain at The Twins. Gave Chroyane the correct terrain code. Updated Taelon village and fixed spawn point issues when attacking or defending the village. Fixed some AI mesh issues in Oldtown. Fixed some issues with Kings Landing great hall scene. Ty ahseph. Fixed archer entry points at Cerwyn castle. Fixed issue with beach ambush scene. Fixed Stoney Sept banners in keep. Slightly adjusted Stoney Sept scene. Fixed entry point when exiting the prison at White Harbour. Kings Landing will now always display the correct flag. Improved siege ladder positions in Duskendale. Improved Casterley Rock scene including siege Ai. Adjusted weight of the Lannister Heater Shield. Fixed incorrect resistance on kite shield. Fixed double messages showing when either your son or daughter join your party. Fixed issues with Sylva's dialogue when recruiting her. Fixed incorrect prices sometimes being shown when hiring companions. Fixed some broken animations and red text errors when entering inns or the arena. Fixed instruments not increasing stats. Fixed standards and crowns not increasing tactics skill. Fixed incorrect text error when upgrading your settlement for a second time. You now correctly need 11 pallets of timber. Fixed issues with rain sounds. Plundered castles or towns should now have the fire extinguished correctly after a few days. Fixed some issues related to player culture. ie, player lords not recruiting. Mag Mar Tun Doh Weg no longer shows up in tournaments. Mya Stone now likes the correct companion. Fixed border incidents sometimes showing 'no faction' if Taelon was the target village. Mercs you have assigned to lead parties should correctly use ships when on sea. Fixed some factions showing Neutral in the troop tree presentation. Fixed an issue with rebellions. Fixed various issues with diplomacy. Fixed incorrect religion statements in towns/castles/village menus. Adjusted religion code to fix some issues relating to this. Fixed a few LOD issues with wildling gear. Removed Ser Vortimer Crane double. Fixed some issues with ambushing parties. Ellaria Sand now has the correct spouse. Fixed not getting the troops you paid for when hiring from a town you own. Adjusted opening text and fixed typos. Fixed maester not appearing in the Eyrie halls. Fixed proficiencies sometimes being lowered permanently after battles. Fixed incorrect naming of some axes. All Arakhs now swing the correct way. Fixed sold prisoners to wandering crows not going to the correct party. Fixed men falling unconcious on the cog ship. Disfrutadla! Se supone que viene la traduccion incluida en el mod, que se la pasé al creador el otro día. Hola 2 preguntas donde puedo conseguir la 3.5 del mod y si actualizo se borrará mi partida antigua??? licaman escribió: Hola 2 preguntas donde puedo conseguir la 3.5 del mod y si actualizo se borrará mi partida antigua??? Hola como andan ? Que trae la nueva versión ? pato03 escribió: Hola como andan ? Que trae la nueva versión ? A mi me tardo de 25 a 30 minutos ..
Una Pregunta estoy descargando la ultima actualización del M&B warband 1173 sera que este mod me sirve en esa version del M&B Warband? 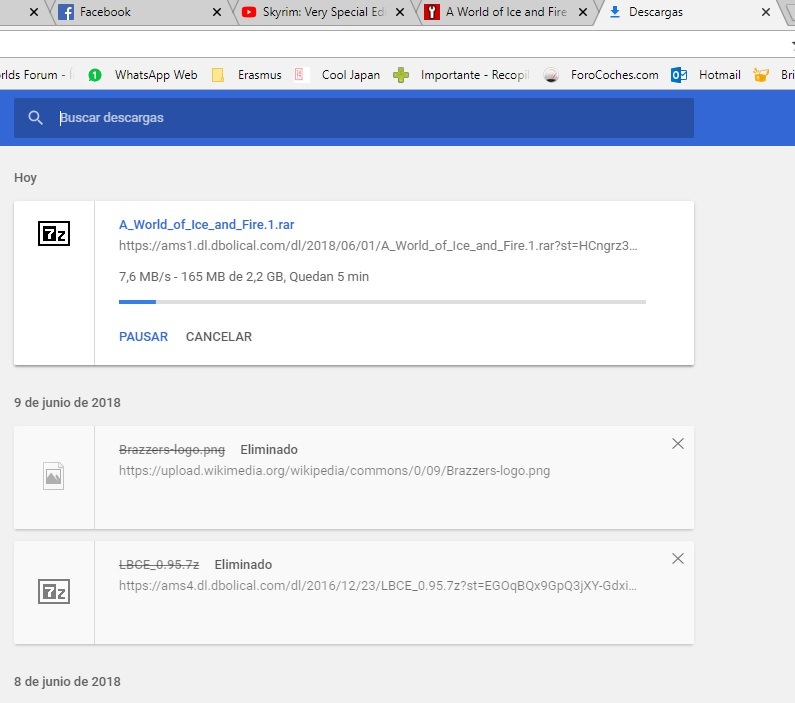 se puede descargar alguna carpeta o algo para actualizar mi versión o algo para no tener que descargar de nuevo todo. ¿Que es mejor como en los libros o en la serie? ¿Cambia algo ademas de los nombres? por ejemplo que en uno haya mas personajes etc o es lo mismo? Hay algun enlace que no sea de moddb? Para descargarlo a 100kb/s prefiero no hacerlo. ya tengo la nueva versión junto con el mod pero tengo todo en ingles y la traducción que usaba en el de la 1.153 no me funciona. hay algún parche en español nuevo ? 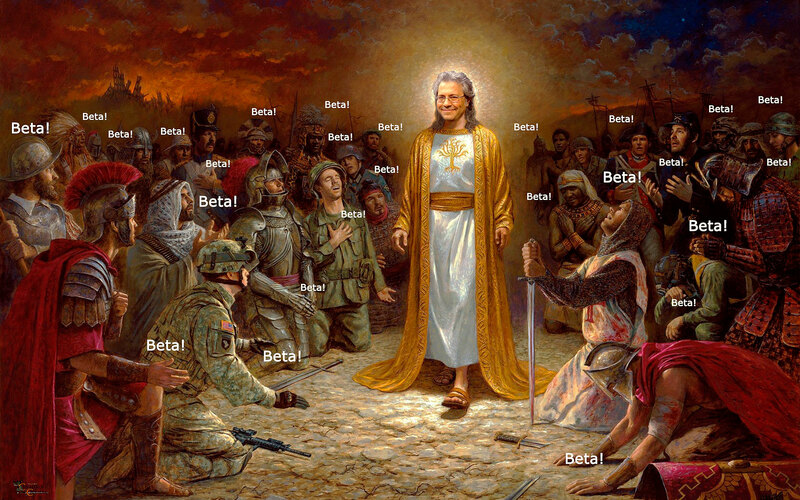 Chuy escribió: Una Pregunta estoy descargando la ultima actualización del M&B warband 1173 sera que este mod me sirve en esa version del M&B Warband? Claro, funciona perfectamente en 1.173. Damitrhio escribió: ¿Que es mejor como en los libros o en la serie? ¿Cambia algo ademas de los nombres? por ejemplo que en uno haya mas personajes etc o es lo mismo? LordArrozConPollo escribió: Hay algun enlace que no sea de moddb? Para descargarlo a 100kb/s prefiero no hacerlo. TYTAN498 escribió: ya tengo la nueva versión junto con el mod pero tengo todo en ingles y la traducción que usaba en el de la 1.153 no me funciona. No tienes que descargar ninguna traducción, ya que la nueva versión viene con traducción al español incluída. Acabo de probarla y funciona perfectamente. Cuanto pesa la descarga del mod? Chuy escribió: Cuanto pesa la descarga del mod? He visto que las heridas que afectan a los puntos de atributos se pueden curar por un precio, pero las heridas que afectan a los puntos de habilidad parece que no... estas heridas se curan con el tiempo? se pueden recuperar todos los puntos de habilidad perdidos por las heridas? Edito: Era el equipo que llevaba encima lo que me quitaba puntos de habilidad. viene la traduccion incluida mi querido caballero? Krone2 escribió: viene la traduccion incluida mi querido caballero?